Have two reliable reports of good 8” ice on Pepin. 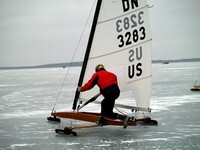 It’s been sailed at Pepin, Wi. Meyer and I will sail/scout Wed at 11 am. More are welcome to join us. Expect to sail from Lake City to Wisc side and Pepin too. Hopeful for DN Westerns there next weekend. The recent snow missed them.